A display platform for LibDataBroker (LDB) based plug-ins. The display is provided through panels, each having sections (Left, Center, Right) corresponding with how a plugin is justified within it. All plugins are disabled by default and you must turn on the ones you want to use. This is to avoid the complete mess that results from all plugins being on with the first use. 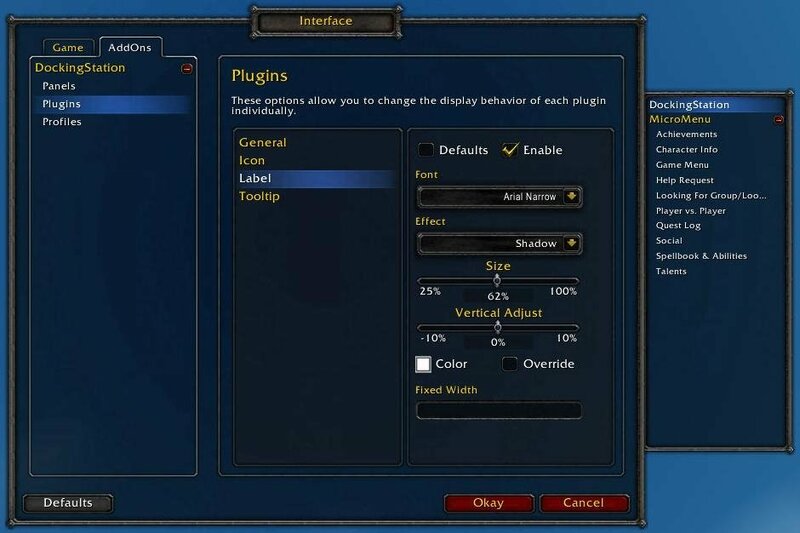 The only plugin on at the start is the one provided by this addon to access its options easily. Just click it to start changing settings. With plugins unlocked you can drag and drop them to other panels/sections and have them automatically adjust to their new location. There are no limitations on the drag and drop capabilities other than the new location for a plugin must be within a panel. You may also change the location of a plugin through the plugin options menu. Almost all sub-sections of settings have a default option. The defaults follow a set pattern. First plugins check their settings, if default, they next go to their panel's settings. 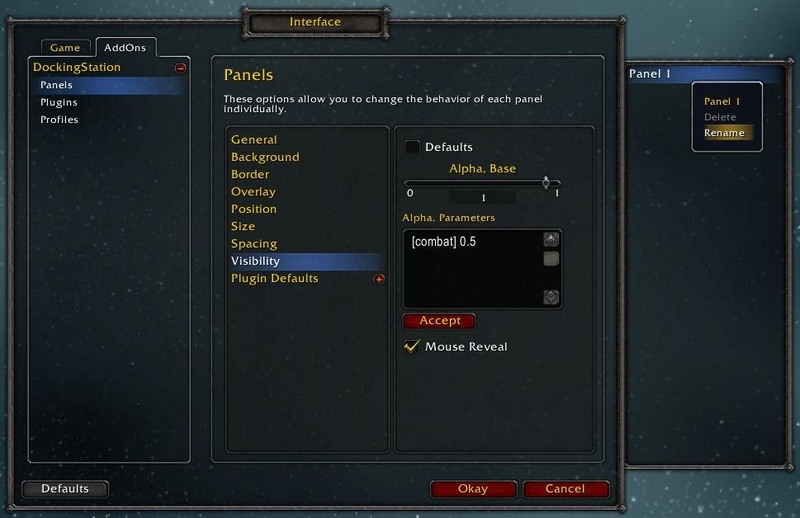 If the panel is also set to default then it defers to the addon's global settings. Finally, if the global settings are still set to default, then the hard coded defaults are used. Note: It is recommended that you delete the folder(s) for an existing addon when updating to a different version. This is to keep files that are no longer used from taking up space. Translators: To submit a translation please just edit existing files (example: DockingStation\Locales\deDE.lua and DockingStation_Config\Locales\deDE.lua) and send them to me. - Combined the panel option categories "Position" and "Size" into "Layout"
- Renamed the panel option "Move Blizzard Frames" to "Shift UI"
- Added panel options "Alpha, Fade In" and "Alpha, Fade Out"
- Fixed a bug with plugin label/suffix using the option "Same as Text"
I get this error and cant figure out what is wrong, looks like an issue with ELVUI, but I posted here to maybe see if anyone else has run into this and had a fix. They are emulating a changing value for LibDataBroker but doing it wrong. That was the ticket. Me love you long time, no bugs in my bugsack, thanks a bunch mate. Last edited by Heartattaq : 10-03-18 at 06:36 PM. Is it possible to hide the bars during pet battles? My Docking Station bars are showing when the full screen map is open. How can I prevent that? I just uploaded a fix for that (v0.5.16). I'm not sure what the intent was to be, but the effect is that one of my a couple plugins were clipping off the right side of whatever content might be present, icon or text. It was to prevent plugins that were doing things outside the scope of what a LDB plugin should be doing from disrupting adjacent plugins. If you have a plugin that is not displaying properly then provide a link to it or paste the code here and I'll try and find out was is going wrong. I changed true to false and saolved my immediate problem, but remain unaware of possible ramifications. DockingStation stopped using LibJostle two updates ago. I could of sworn I'd tried to update but was still two versions behind. Thanks for the update. Sorry I meant that the XIV bar bugs out, not yours! It hasn't been updated since last year. 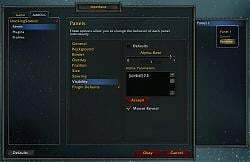 Could you make a plugin for tracking (like an xp bar) cooking and fishing and the main professions? Last edited by DreamsUnderStars : 06-10-18 at 08:37 AM.